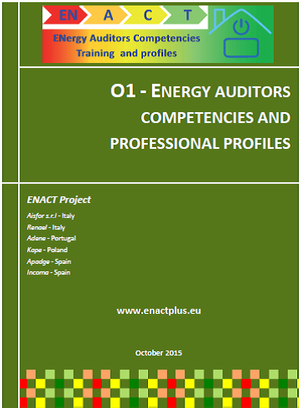 The O1 - Energy Auditors competencies and professional profiles is the first intellectual outputs of ENACT project, a milestone document which describes the results of the analysis and comparison of the National and European frame of the energy efficiency professional figures and labour market in the ENACT countries. The document will be used as a basis for the definition of a common professional profile (activities, competences and training) of the Energy Auditor in the residential sector. The full O1 report is articulated in two interrelated documents: the Comparative Report (O1A1) - the national repots annexed - and the Energy Auditors professional profile(s) matrix (O1A2). The contents of the report are summarized in the Executive Summary, available in English and in all the project languages (Italian, Polish, Portuguese and Spanish) on the results page.